Here are a few examples of recent accidents involving scissor lifts that confirm the vital need for properly trained operators and for more attention to equipment hazards. In November 2014, Jorge Castillo-Riffo was fatally crushed by a scissor lift at the new Royal Adelaide Hospital site. Castillo-Riffo suffered from serious head, neck, and back injuries when he was crushed between a scissor lift and an overhead concrete slab. As a result of his death, workers have demanded specific safety measures to be put in place, including the use of proximity sensors on scissor lifts. However, due to the negligence of this request, another scissor lift worker was crushed and killed in February 2016 under similar circumstances. Another recent scissor lift accident resulted in a Moorhead, Minn. man being severely burned due to an overturn of a hot water tank. The hot water caused an electric-powered scissor lift to malfunction, forcing the two operators to jump 15 feet to the concrete floor. 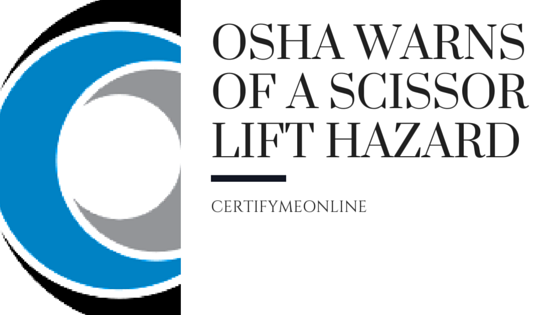 According to the lawsuit, the accident may have been preventable if the scissor lift had been designed with a proper steam condensate overflow system. What Does OSHA Suggest to Prevent Future Injuries and Fatalities Involving Scissor Lifts? Fall protection starts with installing guardrails to prevent workers from falling. And employers can do their part to ensure workers know how to check a guardrail system, stand only on the work platform, and maintain realistic working conditions by operating in only easy-to-reach areas. Stabilization can be improved when workers are educated in ensuring a scissor lift is stable to work on and is not placed on unstable ground. Positioning a scissor lift properly is one of the best ways to prevent injuries and fatalities. Workers need to make sure they are not placing the scissor lift underneath or near electrical wires, near a fixed object, nor in proximity to a moving vehicle. For more information regarding OSHA’s Hazard Alert and for more tips for preventing workplace accidents, read the full report here. And for comprehensive operator equipment training, look to CertifyMeOnline.net. They have created an online scissor lift training program that is 100% OSHA compliant and approved, and only takes about one hour for workers to be knowledgeable in properly operating a scissor lift, inspecting the equipment, and assessing their surrounding environment for safety hazards. Check out CertifyMeOnline.net today for scissor lift certification. This entry was posted in Aerial Lift Certification, OSHA News on March 4, 2016 by admin.